Sabic has unveiled its first PC building-integrated photovoltaic (BIPV) panels for roofing, cladding and glazing applications. Sabic worked with SolbianEnergie Alternative, a flexible PV production company. 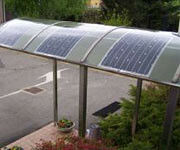 Lexan BIPV panels combine Lexan Thermoclear PC sheet with flexible PV laminated crystalline cells from Solbian and are available in a broad range of structures, configurations and colours. In other news, customers in the future will benefit from lighter weight, more efficient and lower cost solar thermal panels as a result of a worldwide agreement between Sabic and VU University Amsterdam (VU). The objective of the collaboration is to develop and commercialise the university�s technology invention to keep the temperature in solar energy collectors under control. The concept developed and patented by VU University uses an �optical switch� by creating a prismatic structure of the thermoplastic panels made from Lexan PC sheet in such a way that, the sunlight can be reflected before the panels get too hot. Besides its use in replacing metal to consolidate parts, this technology can also be applied to greenhouses. The concept has already been awarded the EUREKA Climate prize by the province of North Holland in 2009, which contributed to funding further development together with The Institute for Fundamental Research on Matter (FOM).